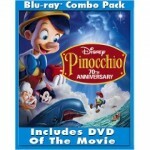 According to Amazon.com the best selling, or what could be called the “most popular” Blu-ray Disc as of this article is the recently released Pinocchio – Two-Disc 70th Anniversary Platinum Edition). Who said hi-def was for adults anyway? Pinocchio, coincidentally, was the 1000th Blu-ray title announced back in October of last year. It was released on Blu-ray Disc March 10. Slated at Number 2, and at the top of the charts since its release on Sept. 30 is Iron Man – The Ultimate Two-Disc Edition . Another kid-flick on Blu-ray trails Iron Man at Number 3, and its John Travolta and Miley Cyrus in Bolt . At Number 4 is Sleeping Beauty – The Two-Disc Platinum Edition. And, arguably the best hi-def release to date Planet Earth – The Complete BBC Series comes in at Number 5. It should be noted Pinocchio, Bolt and Sleeping Beauty also come with a standard-definition DVD. So if you haven’t installed the HDTV in the kid’s room yet you’ll have the DVD to keep them happy until you get around to it. Yeah right. Check out more of the best selling Blu-ray Discs on Amazon.com.